In the above spread, I give an example of how I go about answering a question. I will go through the tarot cards with you to show how this works. The question I was asked: ‘What can I do to improve my relationship with Simon?‘ This question comes from a reading that I gave recently, I’m using the spread with permission and the name has been changed. The card on the bottom left signifies the current situation. This card is the Hanged Man, which turns up regularly when I’m asked for a reading. Its often right at the centre of a general spread, or as in this position, the situation, in the five card spread. The card at the top right, the cause of the situation and in this spread its the Nine Of Pentacles the card that is associated with feeling successful and having made a success out of something. As though the pieces of the jigsaw have fitted together in a way that is pleasing and the outcome is satisfying – its about enjoying the fruits of achievement. The feeling of success and attainment. In this spread this is the feeling and the desire and cause of the situation, a successful relationship, feeling a sense of fulfillment and the attainment of a successful relationship. This that has not yet been achieved, because its still up in the air, as signified by the current situation – the Hanged Man. 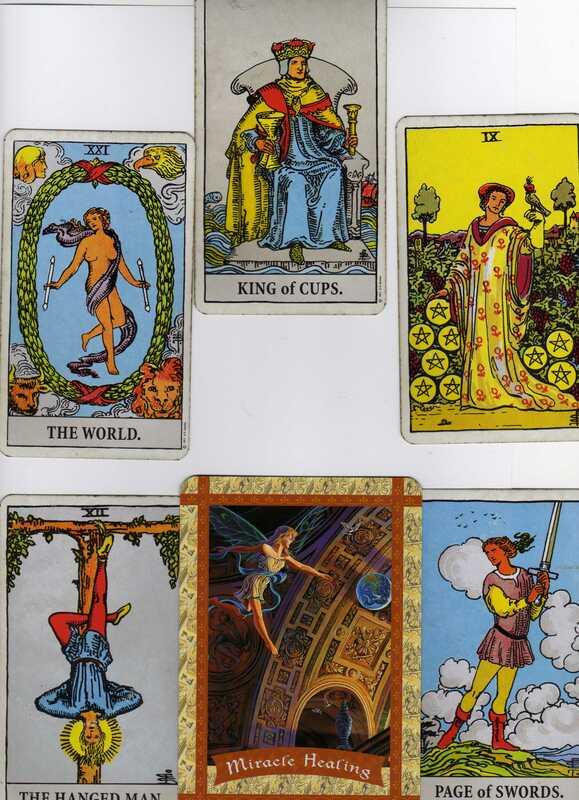 The Card of the top left is the point of interest and in this spread it is the World Card. This card is also associated with success. Building a success with all that the elements available in a given situation ie physical, mental, emotional and spiritual attributes, talents and experiences. Bringing all these together to create success. So there is much positive content and potential in this particular relationship, which can be and is being used to build a strong and satisfying one. 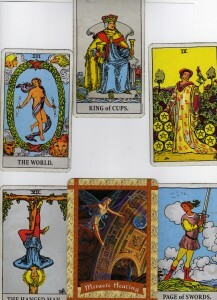 Card on the bottom right, the way forward or advice card, in this case it is the Page of Swords. This is not a particularly comfortable card as it deals with the sense of being up against the world, as though things aren’t going quite right, which brings on feelings of anger, impatience and irritability. In a relationship this would be rubbing each other up the wrong way, loose tempers and tongues, getting angry before thinking things through. So, as this card comes in the advice section and way forward, addressing these dynamics within the relationship, is the way to improve it. Seeking out ways to work through difficulties without resorting to anger, frustration and ill will. Finding out why one or both of the partners is getting angry and seeing what can be done about it. There may, for example, be outside pressures which make one of the partners give off stream to the other one. The underlying irritations need to be brought to the surface and addressed calmly. This is a young card, so much learning of maturity and wisdom is to be gained from doing the above. The card at the top is the Outcome card, in this case the card is the King of Cups. This card signifies a man who is sociable and well rounded, at ease with himself and life in general. It also signifies a situation that has been resolved. The card has a general feeling of well being and satisfaction associated with it. The whole reading augers well for improvement in the situation and for the attainment of the successful and well rounded relationship, that the Querent is seeking. If you’d like your own reading get in tocuh with me here or take a free reading on Eva Tarot. Your thoughts and prayers about the situation have been answered, give up struggling with your thoughts and getting twisted up with your emotions. Trust in the positive outcome that you so desire. Feel and know that the situation is being taken care of perfectly.